Masters of Disguise, the expansion for the fantasy board game of strategy and adventure, Age of Thieves, is due to release in February. If you haven’t the chance to try the base game yet, now it’s a great time to learn more about its setting, components and gameplay. Designed by Slawomir Stepien and published by Galakta, Age of Thieves presents a setting of a low-fantasy Renaissance city, Hadria, and an immersive story. Hadria is a port metropolis located on the northern fringes of the mighty Empire. Each player is a master thief about to commit the most daring burglary of their career. 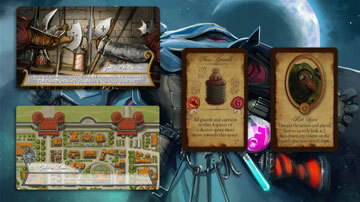 During the game players may use the unique abilities of their thieves as well as various action cards, which represent maneuvers, alchemical potions, or complicated devices inspired by visionary ideas of Renaissance inventors. 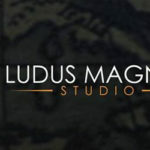 The thief who will manage to escape through one of four city gates taking with him the Emperors’ Jewel or other valuable loot wins the game, and anyone who stays inside Hadria when it ends will be caught and mercilessly thrown inside the city dungeon, and their names are erased from the annals of the omnipotent Guild. 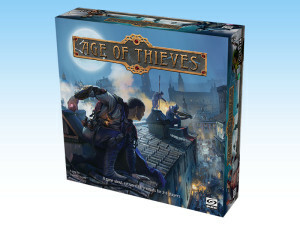 In Age of Thieves, players can choose among six arch-thieves who are - just as their name suggests – masters of shadows, mad geniuses, breakers of locks, and true artists of thievery. different characters, each with his own motivation, weaknesses and strengths. The six characters are represented by thief sheets. 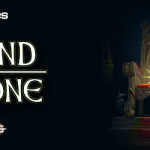 Each player will choose one character in the following cast of personalities: Jasmine, the Cunning courtesan; Joanne, the Renegade captain; Morius, the King of the Undercity; Nikolai, the Accursed inventor; Noiron, the Vengeful noble; Zain, the Artful arsonist. Each thief is represented in the game by a thief sheet, to which players can refer for that thief’s "passive" special ability. Together with the thief sheet also comes a special action card representing an "active" ability, which is different for each thief. This helps to diversify the thieves even further, to give players a unique experience each time they play a new character. The game is set on a game board representing Hadria, "Pride of the North," a glorious city – the most impressive and one of the richest places in the Empire. The game board is divided into five districts and toned-down colors, inviting players to immerse themselves into the city, a hub of fervent activity for rich merchants, diligent burghers, resourceful inventors… and cunning thieves. 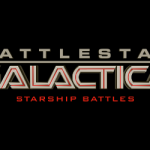 Players will move around the board using the overlay of interconnected spaces. When the guards and jewels are placed on the board, every move will count. 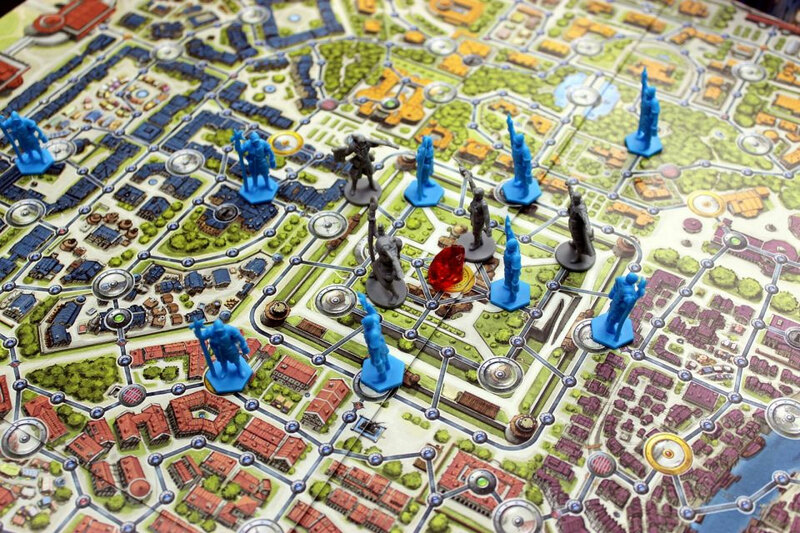 A view of the game board, with the guards (blue figures) placed on it. The first thing that the players will place on the board are guards. Blue, detailed figures are easily recognizable and will try to catch the thieves on every occasion. Next come the city tokens, which represent various events that you can encounter during your nocturnal adventures. There are 10 types of these tokens, each with a different impact on the game. City tokens are not the only thing that the players will run into. There are also certain gains; three different kinds of jewels – the red Emperors’ Jewel (the ultimate goal of every thief), green jewels (worth 2 Victory Points) and yellow jewels (worth 1 Victory Point). Occasionally, some actions will result in introducing certain effect markers into the game that stay on the board until the end of the current turn. These are smoke and fire markers that affect spaces they are placed on. These are a byproduct of playing certain grenade action cards by the thieves. From top left to right: Event card, District card, Action card, Special Action card. There are only three types of cards in the game. The most important are the Action Cards – the cards that players will use to set traps, lure guards, move silently, etc. Next come Event Cards. The Event Deck is there to make sure that each game is different. These are global effects, affecting each thief in the game. Additionally, there are also District Cards, which indicate where the players must flee after the Emperors’ Jewel is stolen. 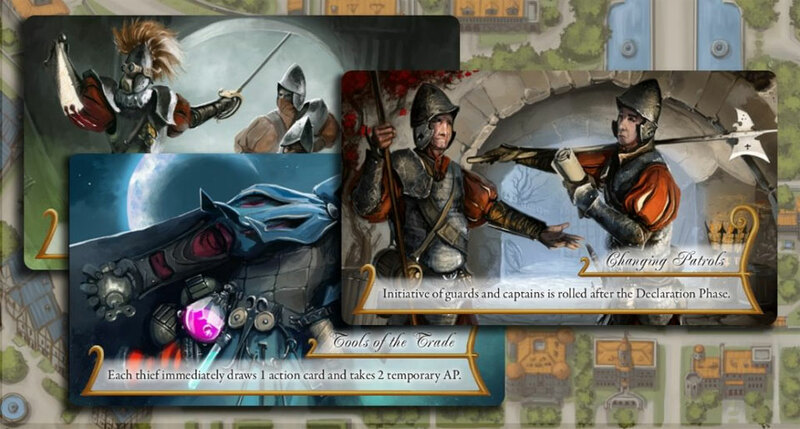 Each player will plan his actions behind a screen (with a city token description – a helpful reminder on the inside of the screen) and guards have their own sheet, so the players won’t have to check the rulebook in case they forget what are the basic rules for the guards. Lastly, there are three more tokens that make life easier: Organizing Tokens (for those tight situations, when there are 3 or more figures on the same space), Best Burglar Token (awarded to the player who steals the Emperors’ Jewel) and First Thief Token. 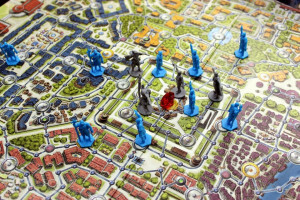 After setting up the board (place city tokens, figures of guards and jewels on indicated spaces of the city map), each player chooses one thief to play. 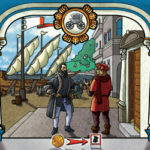 Once the thieves are chosen, each player takes 2 basic action cards that are always available and enable him to move around the board or draw new action cards as well as 2 general action cards that give him a range of various possibilities – be it bribing a guard or sending a clockwork owl on a scouting mission. Finally, each player takes 10 markers of Action Points (AP), their thief’s unique figure and a screen, behind which they will be planning his activities. Now players are ready to start the game! Event cards change the conditions of the game and introduce new, temporary rules. Event cards control the flow and the length of the game. 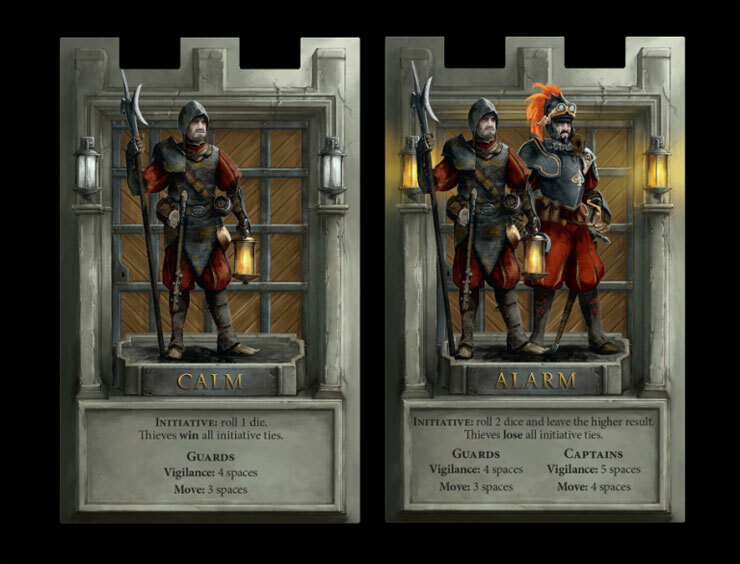 Each turn players draw and reveal 1 event card from the top of the event deck – the Calm Deck or the Alarm Deck depending on the stage of the game. Event cards change the conditions of the game and introduce new, temporary rules. The first player reads the revealed event card aloud, introduces its effect and then rolls a die to determine the initiative of the city guards – how quickly they will react and how capable they will be in spoiling the thieves’ schemes. 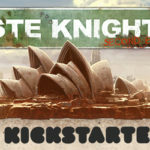 Once the initiative is rolled, each player draws 1 action card. The Declaration Phase and the Resolution Phase are the most important steps of each turn. In the Declaration Phase the players simultaneously and secretly plan their actions for the current turn. Each player declares his action cards, i.e. they place behind their screen any number of face-down action cards from their hand and then places on top of their choice their available AP. The number of AP placed on a given action card determines how quickly this card will be resolved – and whether the player will do it before or after the city guards activate. In other words, the more AP you place on your action card, the sooner you may use its effects. City Guard Sheet (Calm side and Alarm side). Once all players have planned their actions, it is time for the Resolution Phase. 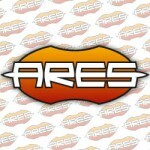 The order of activities in this phase is resolved based on the initiative. For the guards and captains, the initiative is determined in the Events Phase by rolling a die placed on the city guard sheet. For the thieves, the initiative is indicated by the number of AP markers on a particular, declared action card. 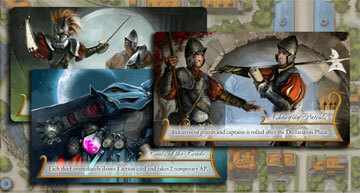 Example: Morius has declared two action cards – one with 4 AP and another with 1 AP. Meanwhile, Noiron has placed all 10 AP on one action card. The initiative of the city guard is 6. 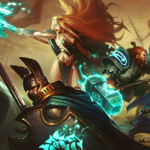 It means that Noiron will resolve his action first, followed by guards and captains and finally Morius will resolve his two actions – first the one with 4 AP and then the one with 1 AP. After the players and the city guards resolve their actions, the game proceeds to the Clean-up Phase, during which the players prepare for the next turn: all declared action cards are discarded, various temporary markers, such as fire or smoke, are removed from the board, the first thief marker is passed to the left and the players gather their AP markers to reuse them in the next turn. The ultimate goal of each thief is the Emperors’ Jewel hidden inside the palace in the center of the board. Any thief who manages to steal it and carry it away from Hadria (thus escaping from the board) immediately wins. However, it is not the only way to win. When the Emperors’ Jewel is stolen, the alarm is raised in the city – the players have only 5 turns to try wrestle the jewel away from their rival’s hands and leave Hadria. If, at the end of the fifth turn, the Emperors’ Jewel is still on the board, but some thieves have managed to escape, the winner is the player who has gained the most VP for the stolen riches.